Michaelangelo. Botticelli. Galilei. Machiavelli. Da Vinci. Famous names from the period of rebirth in Europe, also known as the Renaissance. The hub of this unique time period was none other than the city state of Florence. Science, math and arts all flourished. Remnants of the era remain today not only in big museums and preserved buildings, but also on street corners and in tiny squares. Our biggest mistake during our time in Florence was not our Airbnb mix up, or choosing to visit on a Sunday. It was imagining that a single day in Florence would be enough. Florence is a city so full of history and culture that it deserves so much more time. To wander the streets, to immerse yourself in Renaissance culture, and to appreciate all of it. Our mishaps in Florence started before we even got into the city. After our extremely hot and incredibly beautiful day spent town hopping in Cinque Terre (read my Riviera Hopping post here) we had a few hours’ drive to get to our centrally located Airbnb. When we made the bookings month in advance, Adrian and I had split booking the accommodations between our separate Airbnb accounts. I was in charge of most of Italy, and remembered booking this particular location. It was late afternoon by the time we connected with the host. Confusion ensued. The host received my message and said that she would be happy to accommodate us, but that we would have to approve the booking first. Why would we have to approve a booking we had made two months before? Did we not make the booking at all? I realized it was nowhere to be found in my bookings. Panicked, I made a phone call to the host, who forwarded me to her friend who spoke better English, who still had no answers. We arrived, confused and a bit worried, but were greeted and shown our reservations. The host spoke exclusively to Adrian, confirming booking details and house rules. I was offended. Was this not my booking? Why was there still confusion? The answer to this whole situation may seem obvious, and it should have been to us as well. In our defense we were now three countries in, and very exhausted. The answer was simple. Adrian made the reservation. I am sad to report that it took us days to figure it out. Keeping track of bookings clearly is not our strongest point. Forgetting to book trains (from London to Paris), booking wrong pick up points for a car, and now just completely forgetting who made the booking. I think on our next trip we will go old school and use a printer to have all of our bookings right in front of us. Hopefully this will help us to avoid the messes we seemed to get ourselves into time and time again, relying on emails and technology to keep track for us. The next morning we headed to the city center, where we had two scheduled back to back tours. It worked out so that our visit took place on a Sunday. In a religious country such as Italy, we figured that would have some implications. Our tour reservations said only that certain access was restricted. We knew we would probably not be climbing the famed dome of the city, but that was alright in light of all else we would see. 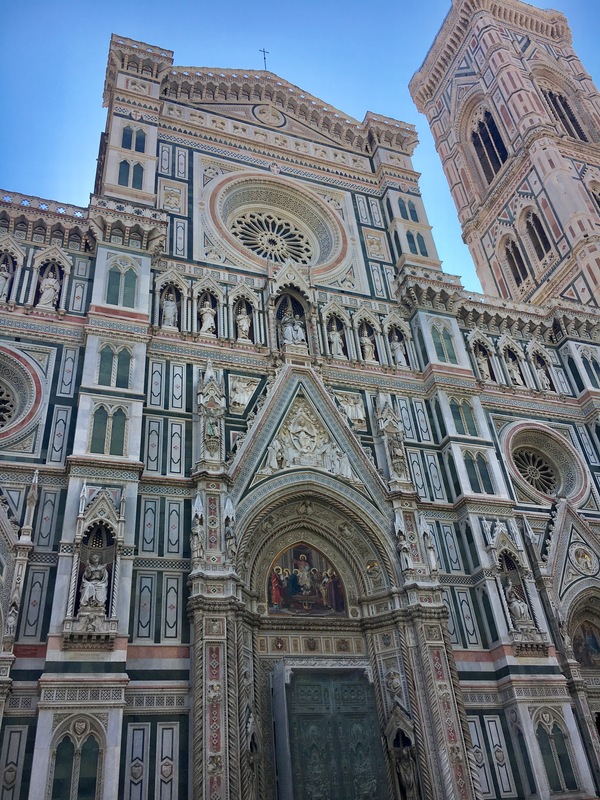 Our morning consisted of a walking tour, where we strolled the streets of Florence on our way to the famous cathedral, “Cattedrale di Santa Maria del Fiore”. As we arrived at the work of art and place of worship, our tour guide started to talk about its history. About 10 minutes in, someone interrupted to ask when we would get to go inside. It became clear that would not be an option, which was news to many people on the tour. It makes sense as religious services are commonly held in the morning, but it seemed to be something not many of us were prepared for. Seeing the details on the outside of the building and standing opposite to Brunelleschi’s dome had me wanting to see the interior so badly. Unlike many North American tourist sites, places in Europe (and especially places of worship) close for Sundays. Although our tour was a bit misleading in its fine print, we should have double checked on the attraction’s website, where that information is clearly located. I wish we had had more time specifically to wander into the marvellous structure. Our tour ended here, and we had a quick lunch break before joining back together to wander the Uffizi. As a history major in university (fun fact!) I learned over and over about the Renaissance. The period of thinking and progress that propelled Europe to become a major power in the modern world. While learning, the most important key term we always learned was Florence. It embodied the Renaissance. It really does. There is nowhere else I have seen that brings math, art, sciences and beauty together the way that Florence does. The David by Michaelangelo is not simply a work of art. It is a piece of magic that uses proportions and lines and details and science of the human body to transform a piece of marble into a realistic looking human. The facade of the famous cathedral is not only art to pay respect to the Mother of Christ. It is symmetry and details that combine to create something that does not even look real. The unfinished “Adoration of the Magi” by Da Vinci shows emotion and details that seem unthinkable. There is no doubt that Florence IS the Renaissance, or at least a piece of it that has stood the test of time. Our time in Florence was short, but it was filled with beauty. I finally understood why all my history books referenced this amazing period of time. The art was amazing, the architecture the most beautiful we had seen thus far on our trip, and the food was pretty darn good (I decided that very day that eggplant parmesan was my favorite thing to eat, ever). Visiting Florence definitely requires more than a day. Visiting requires giving it the attention and detail it deserves, just as its most famous characters gave to their famous works that we still love today. I love love love Italy! Your post makes me miss it so much! Florence is truly wonderful in every sense and your pictures capture it well. I am happy the lodgings were sorted out and you were able to enjoy your travels there. I was very relieved when we got it sorted out! Thank you so much, sometimes it is hard to capture places as beautiful as they are in real life. I was very relieved to get the accommodations sorted! One single day is definitely not enough time! It’s such a beautiful day and SO much more time is needed to explore it. I agree! I know someone who lived there for a few months and still did not feel as if they had seen it all! Oh wow…this is gorgeous. I would love to visit! You should! It is a beautiful city to explore! I love Florence! It’s such a beautiful city! I had a similar issue with an Airbnb in Rome (I was traveling in a group of 4 and we had all made different reservations). I did make a binder with all the bookings and was able to show it to the host. A binder is such a great idea! So easy to lose track of reservations when they’re all over a very full inbox! absolutely stunning, i would LOVE to visit florence and will definitely need weeks or months to stay!! A lot of time is needed! Thanks for stopping by! A pity you only stayed one day indeed. But I undersrand: so many cities in Italy deserve more than one day, you could stay there for months!